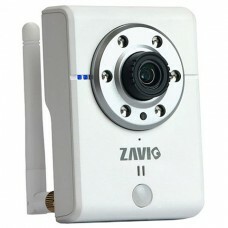 Compact IP camera, all-in-one 720p model with wireless capability. It includes H.264, removable IR-cut filter, IR LEDs, micro SD card slot, two-way built-in mic & speaker and wireless support. Ideal for the most practical live viewing and recording solutions to varied requirements. Compatible with ZAVIO’s free 32-ch NVR software, free mobile video management app and plug-and-play solution EZvuu, users can easily setup a surveillance system for home, retail shop or small office and 24-7 monitor from mobile devices, PC or laptop without any extra cost.